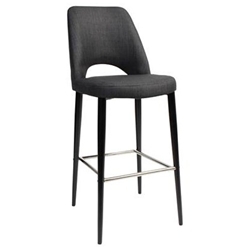 Features: Indoor Bar stool for Kitchen and Bar heights. Colours: Stocked in 2 Vinyl and 3 Fabric colours from our Commercial range. Frames: Steel powder coated Black and Natural Woodgrain frames with Stainless steel foot rest. Matching side chair and Tub chair also available with 9 frame styles to select from.